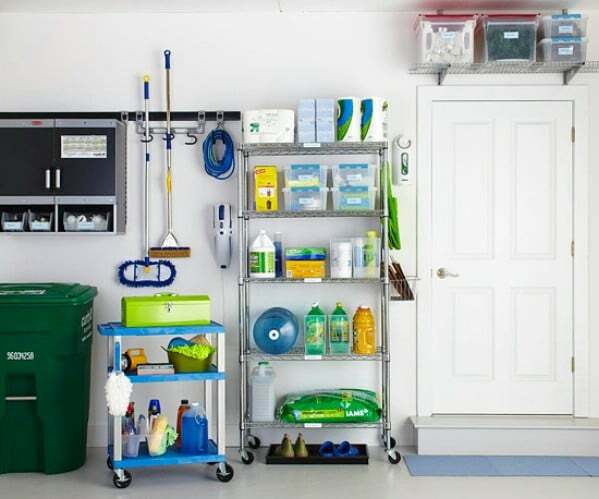 From hangers for your garden tools to adding a splash of color to brighten up your dull garage, we have just the tips that will make organizing and cleaning that area a joy and something that you will want to brag about when you are finished. 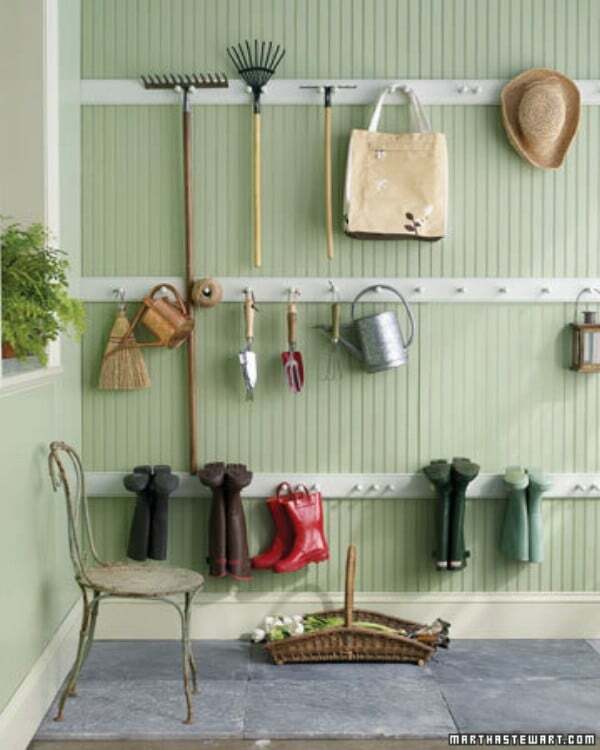 If you have brooms, mops or garden supplies that you want to hang out of the way, an inexpensive wall organizer is a great choice. 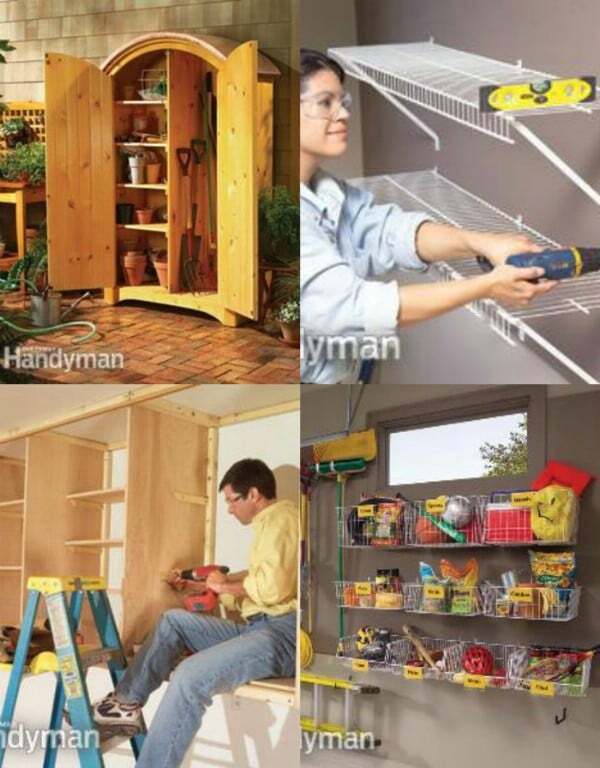 You just attach it to the wall and slide items in by their handles. 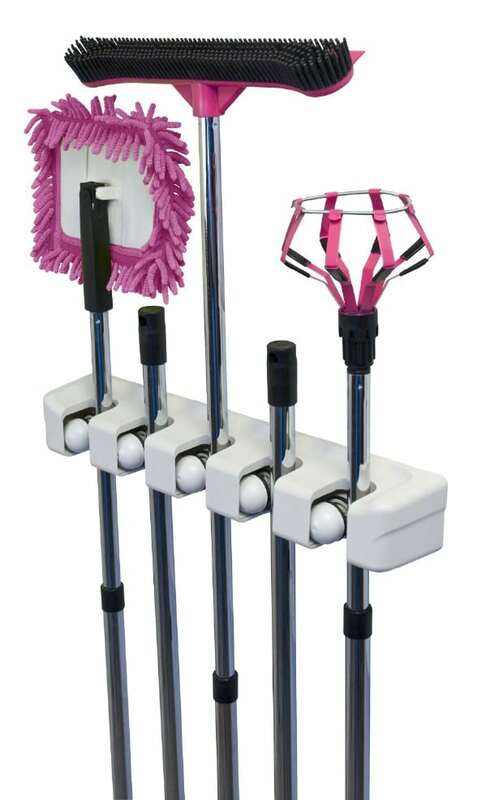 This is a great way to keep brooms and other cleaning tools off the floor and keep them easy to access. 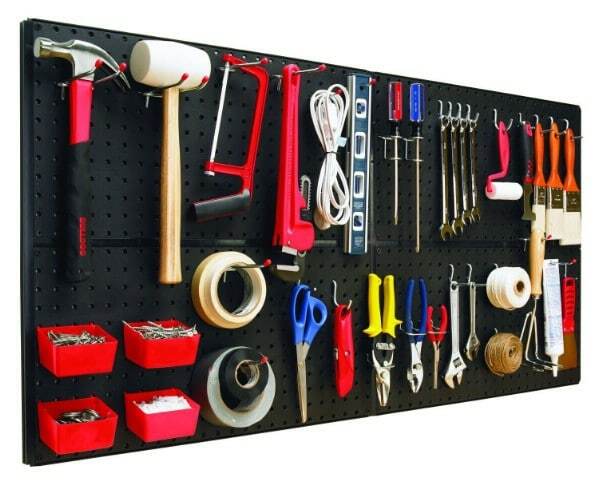 Ok, so we’ve mentioned pegboards a few times but they are honestly the easiest and most efficient way to organize garage items. 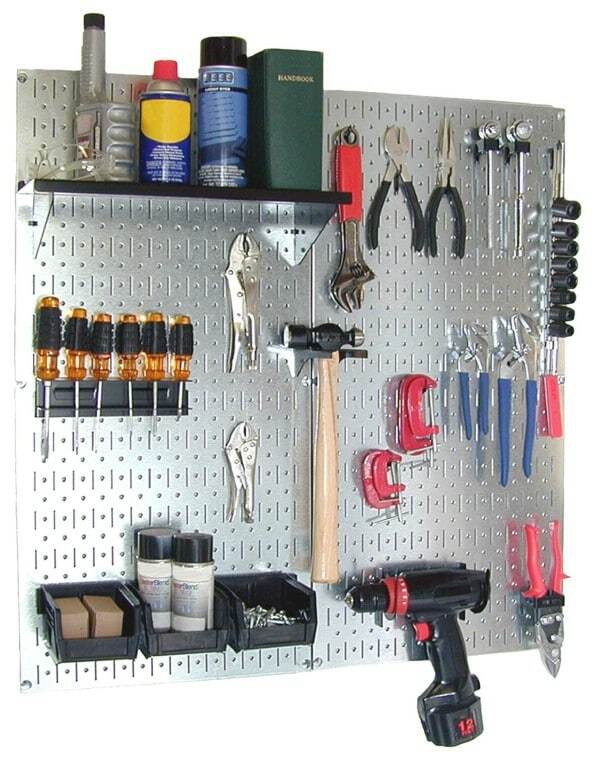 You just have to hang the board on the wall and add the included hardware for storing just about anything. 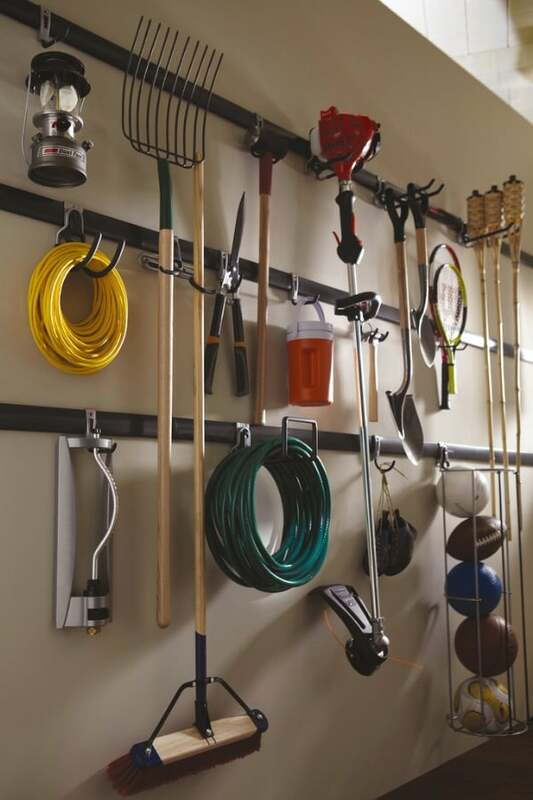 Some systems even include hooks and small bins to keep you completely organized from start to finish. The wall studs, that is. 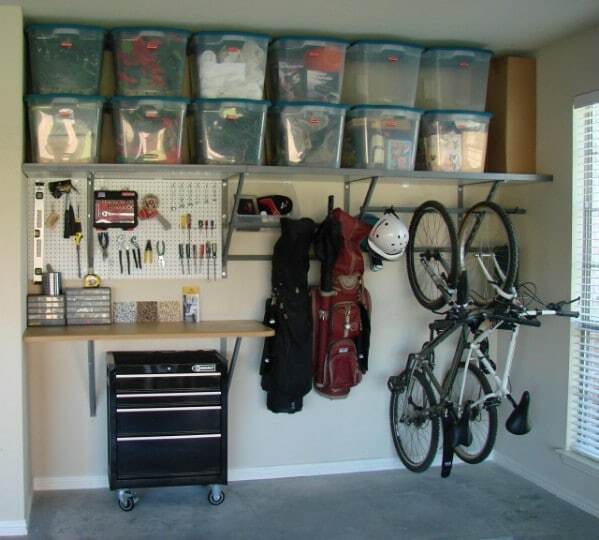 If your garage walls are partially unfinished and you have studs that you can utilize, this is a great way to keep things organized. 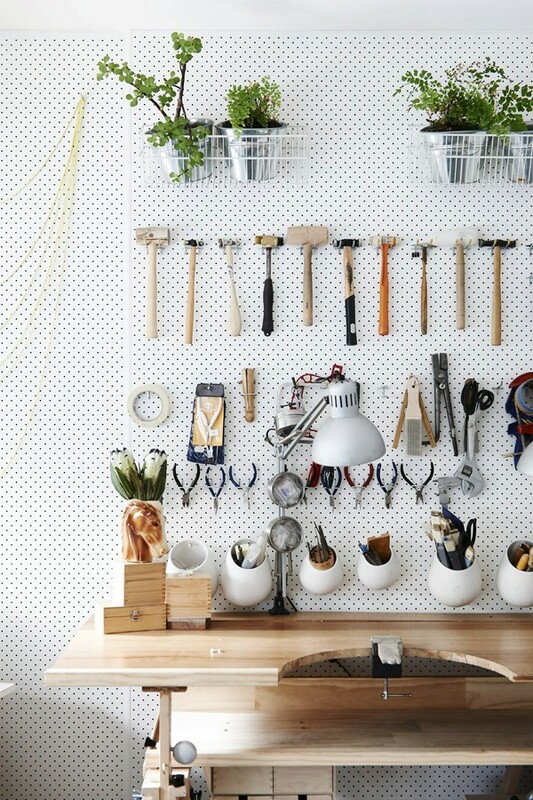 Use those studs to hang heavier items or add a few boards to the front to make a semi-shelving unit. 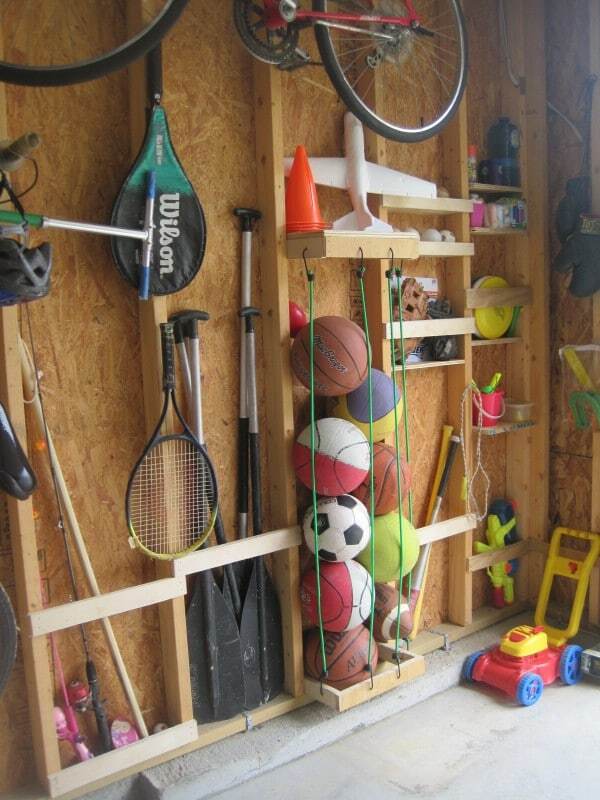 A few bungee cords hung on studs gives you a great place to store all sorts of sports equipment. 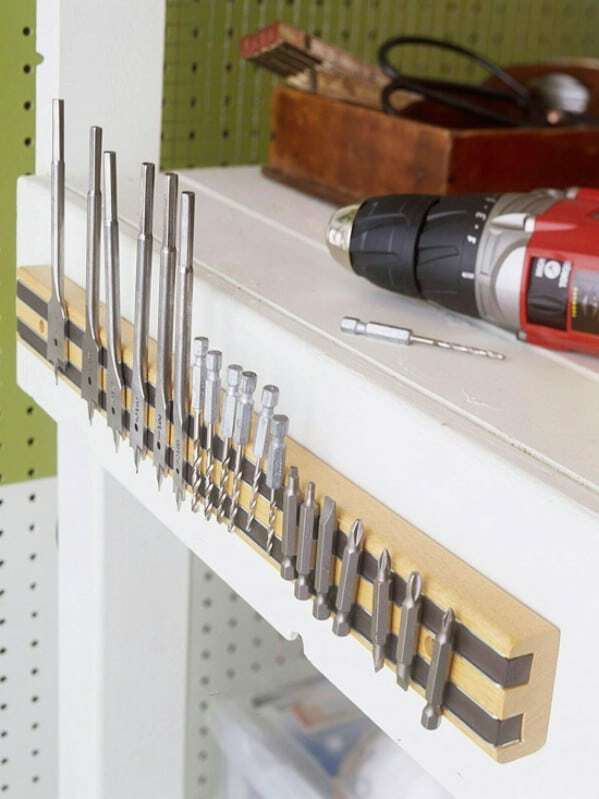 Via: Designedtodwell – Making Use of Some Studs! 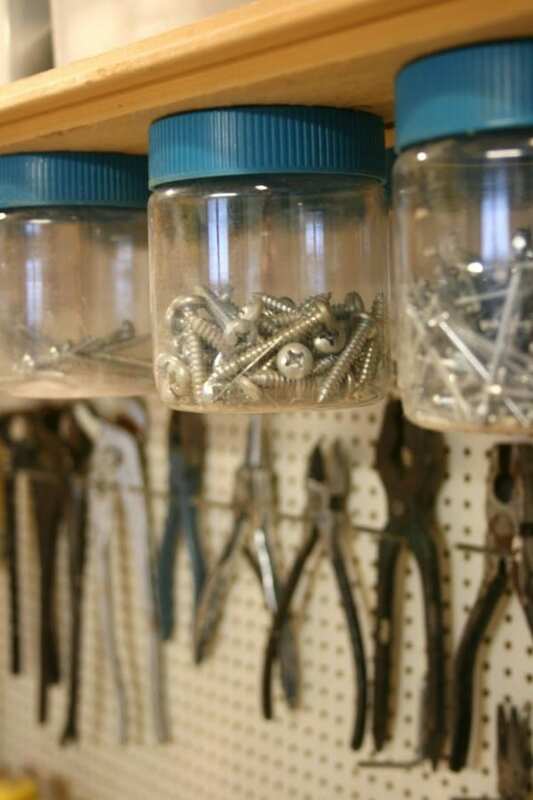 Keeping nails and screws, as well as other small items, organized is easy when you simply take empty jars and mount them underneath shelving. 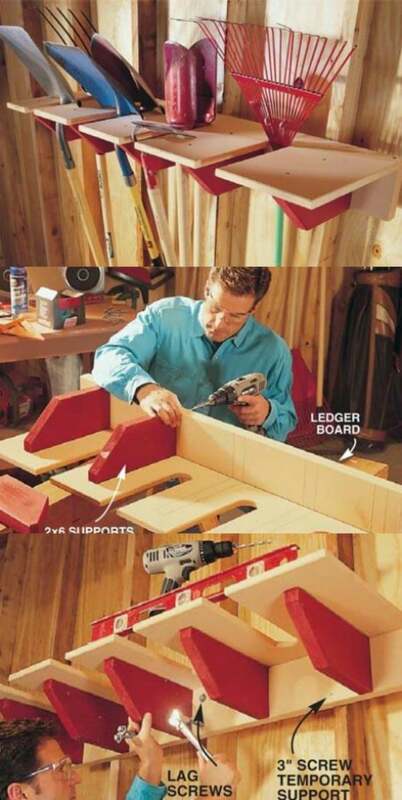 You just use a screw through the lid of the jar and then the jar screws onto the lid. 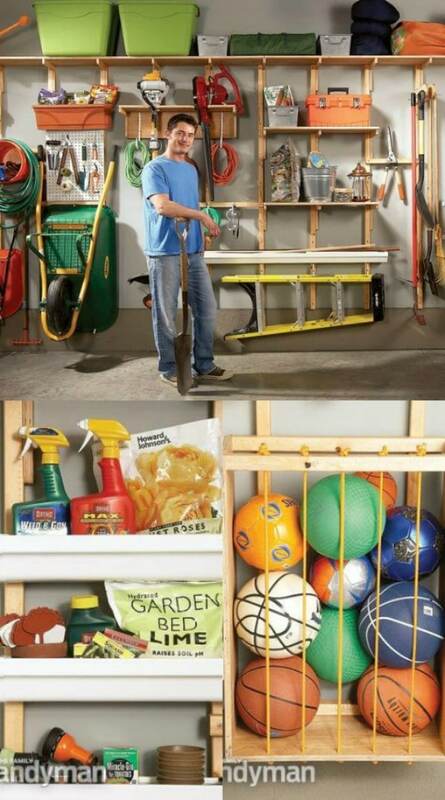 This not only keeps those smaller items within reach, it helps to give you more shelf space for other things. 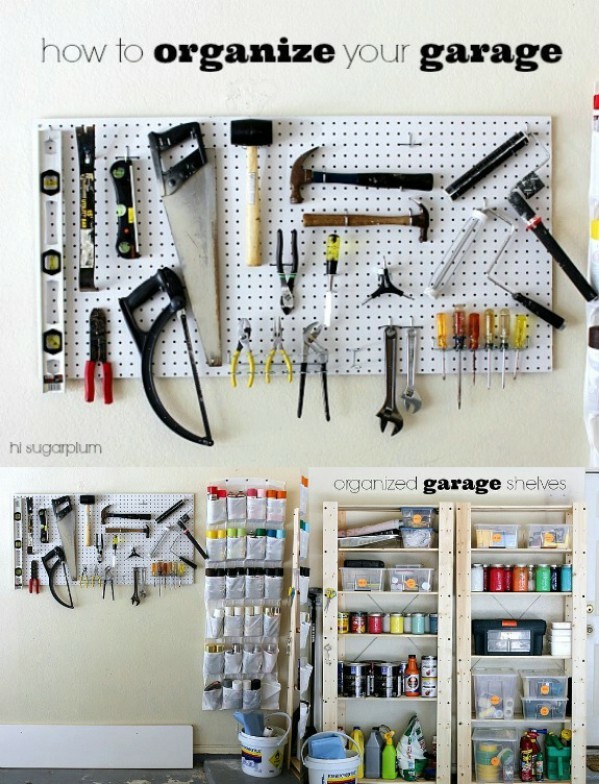 Via: Chezlarsson – Screw Organizing! 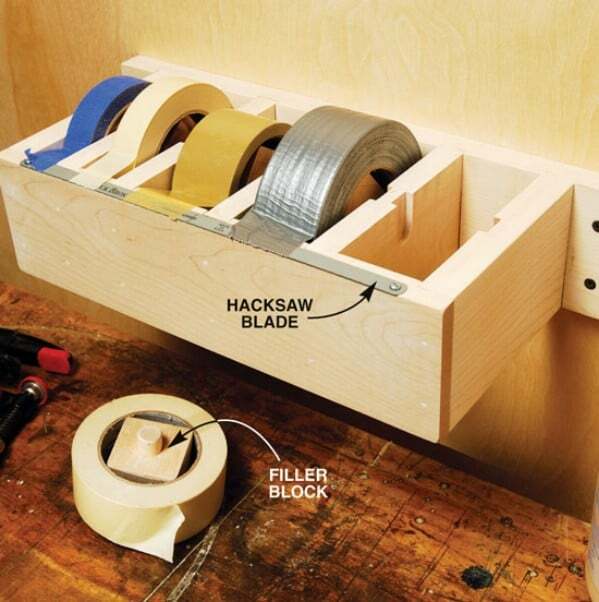 Magnetic strips are great for tool storage. 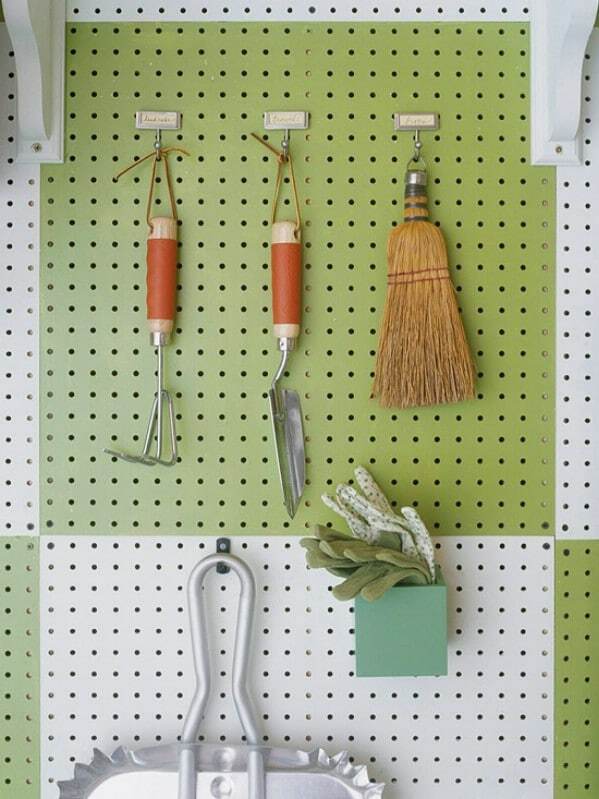 If you have garden trowels or other items that you need to keep handy, you can add magnetic strips to a shelf or the wall to keep these tools within reach. 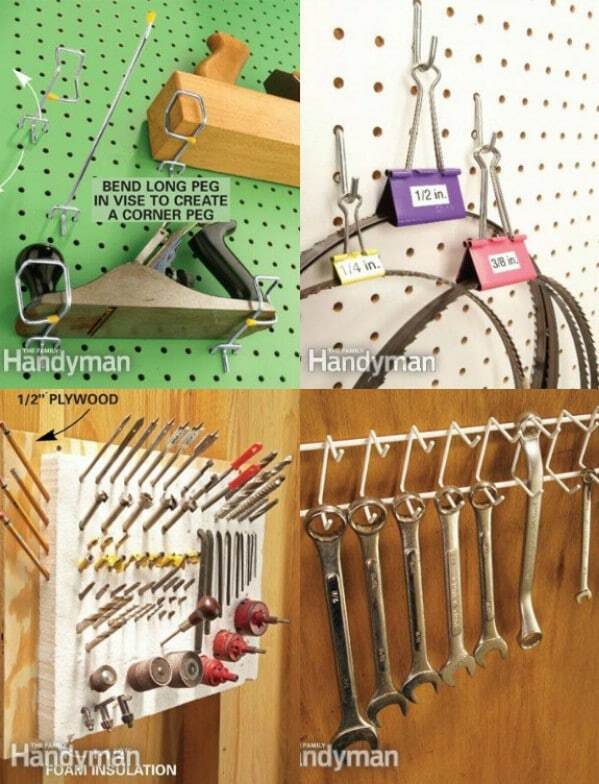 You can also put many tools on hooks on a pegboard or keep them in a labeled plastic tote for better organization. 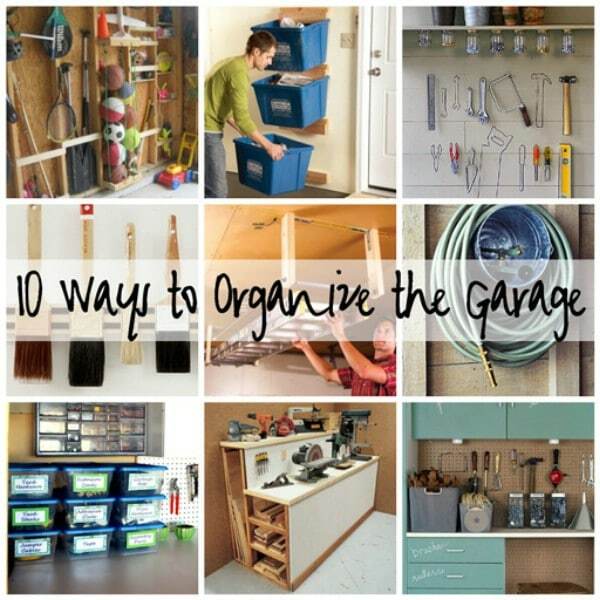 Via: BHG – Organize this: garage gear! 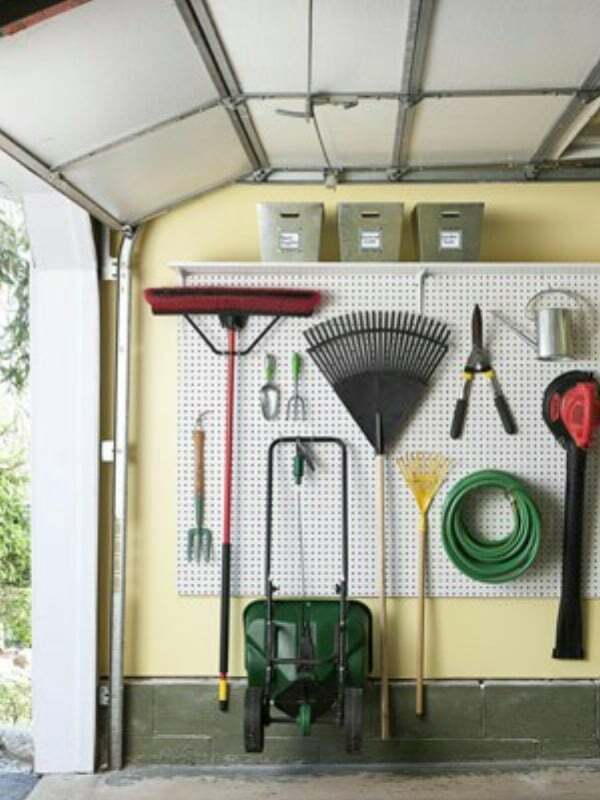 Organizing the garage does not mean that you have to use all of the walls for storage. 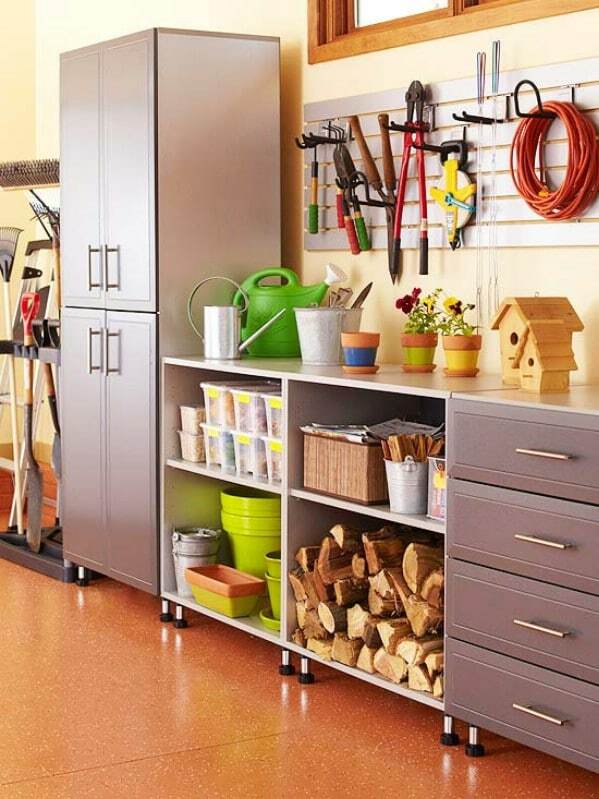 You can utilize just one wall and create a great organization center for practically anything that you need to store. 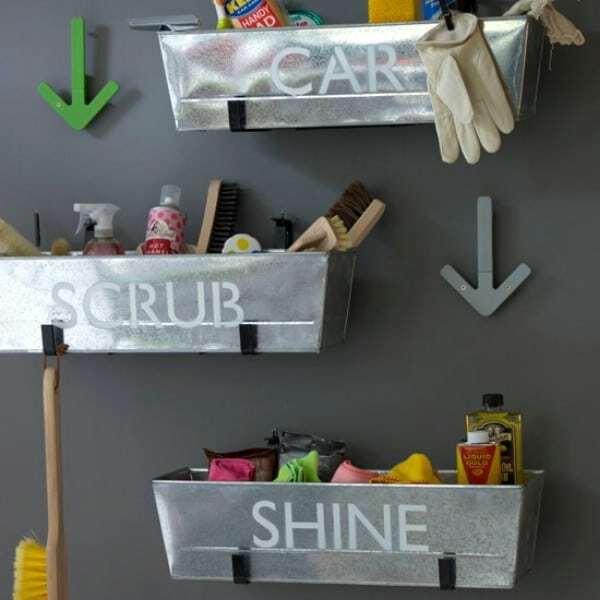 Metal cabinets and shelves are a good start and you can add labeled totes or baskets for items that need a permanent home. 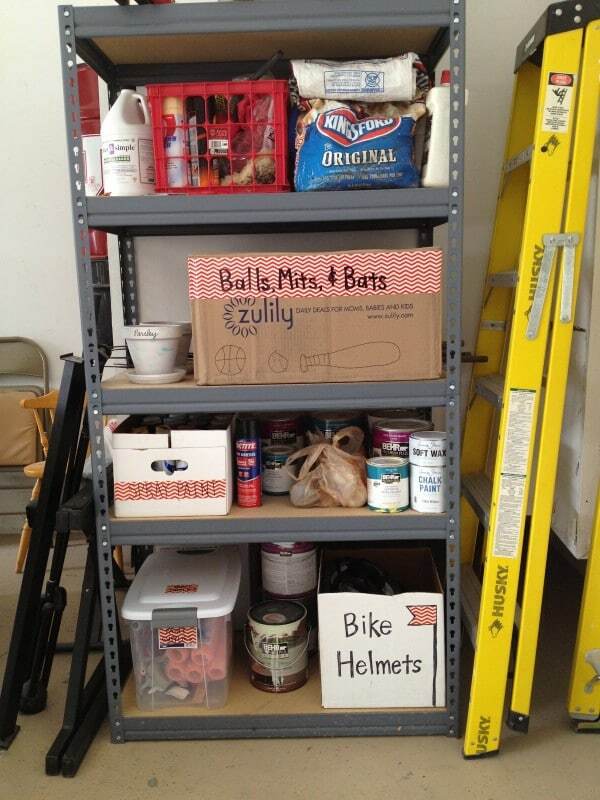 Via: Versastyledesign – Shelving that works hard and looks great! 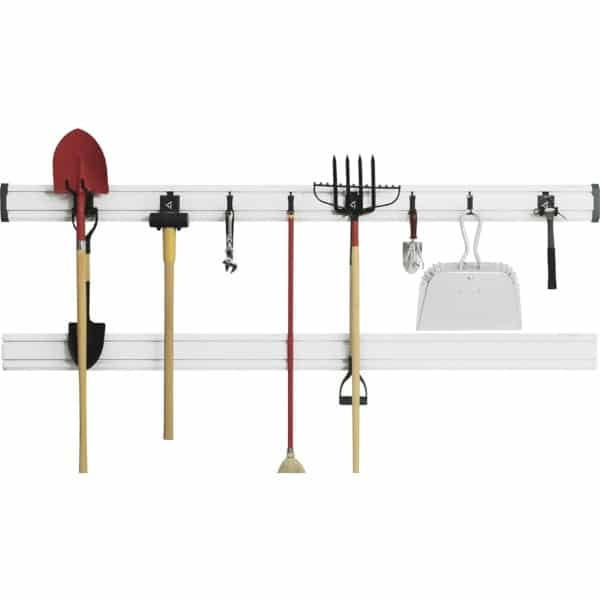 A mop and broom hanger rack keeps your cleaning tools organized and tidy. 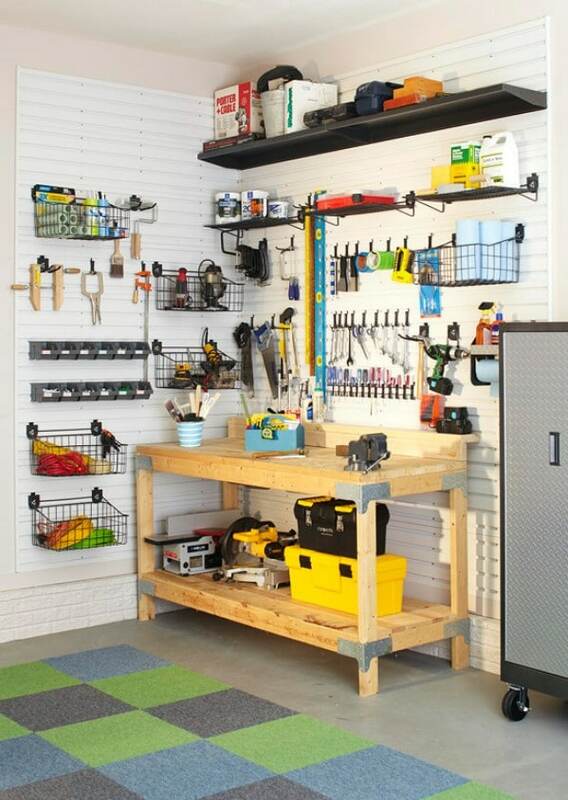 oh.while nice,you assume you have WALLS.how about organization in an unfinished METAL shop?where the ribs are 6-8 ft apart? 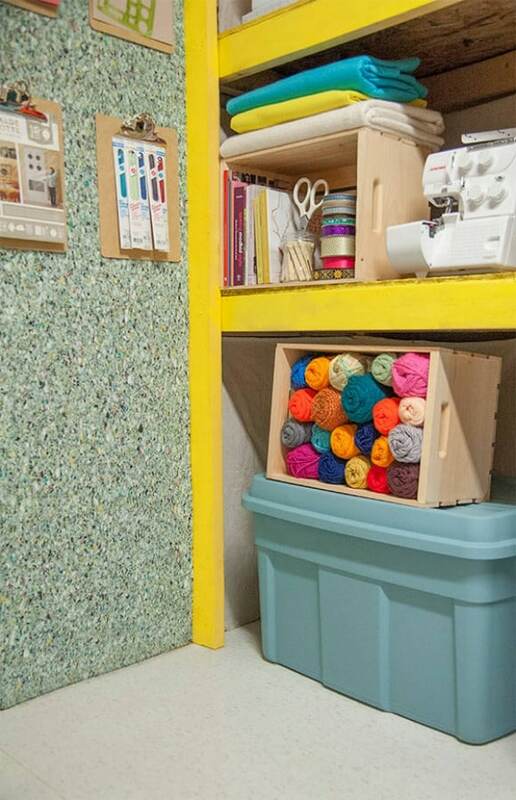 Carpet in a garage? I am that person. I was reading a section above and saw that. 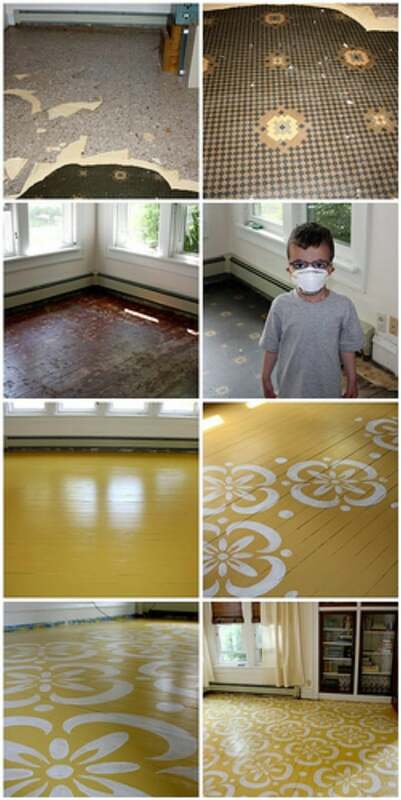 I love woodworking and restoring, up cycling, recycling and refurbishing! I LOVE carpet because it helps trap the dirt and dust. 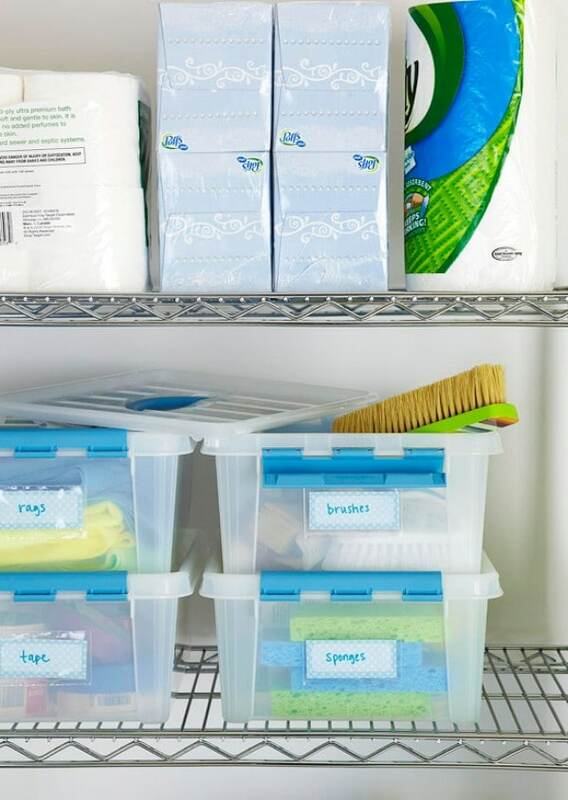 It makes it SO much easier to clean and BREATH! Just an idea! 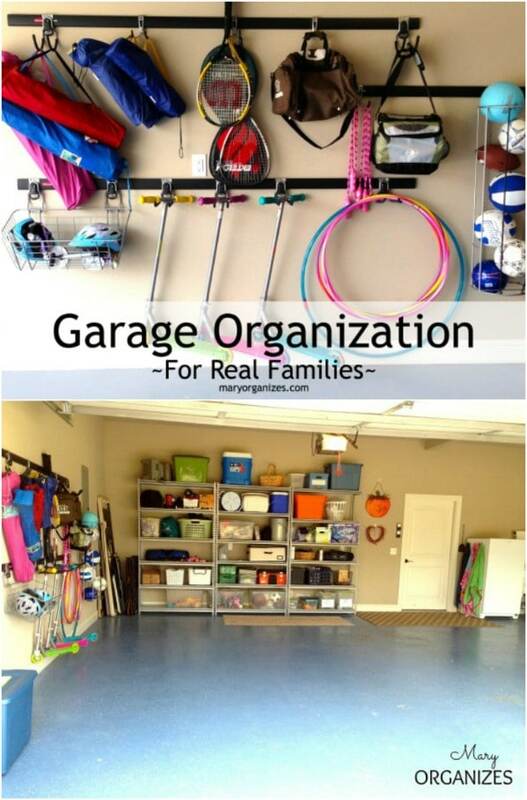 I will never have anything but carpet in my garage/workspace. Just an idea! I love this îdea because i love to vacuum! I agree. 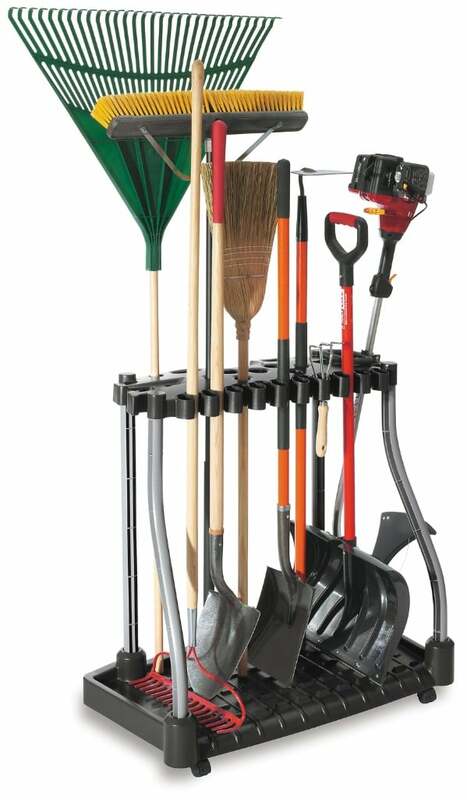 I thinks it traps all of the dirt before it has a chance to get in the house. Sometimes I just use a leaf blower to clean it. 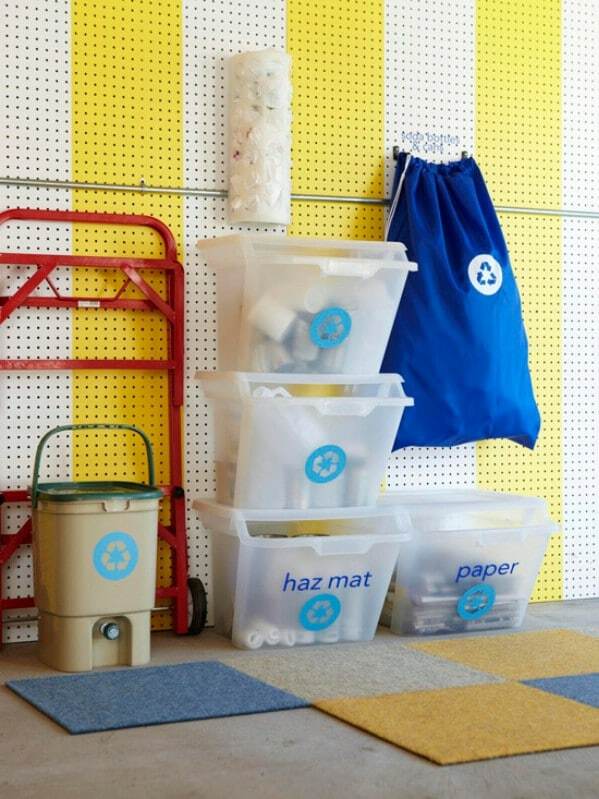 Been doing this for years – recycling carpet that’s being tossed. I had to share. I don’t know what the internet has become, but this is one of the worst articles I’ve ever read. It said the same things over and over again. None of the so-called “tips” are useful in the least. 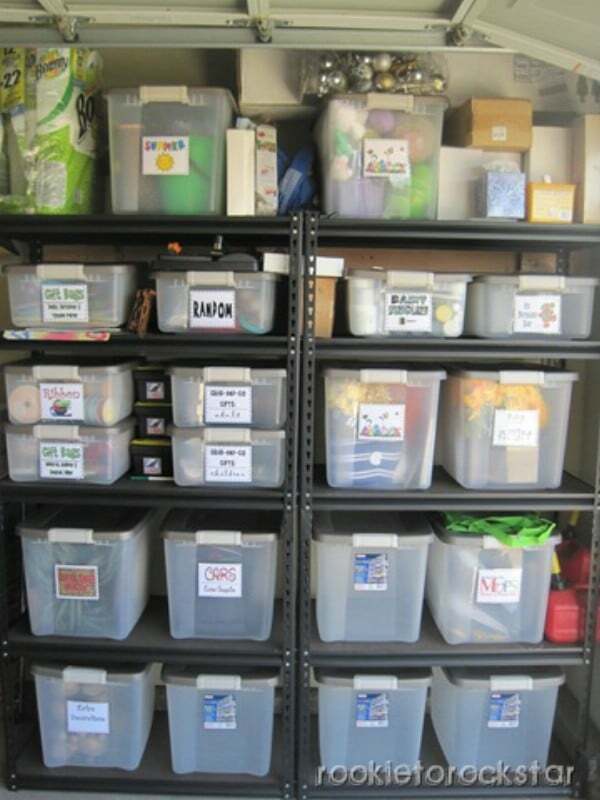 “Organize a wall!” “Organize a corner!” Organize an area!” Not helpful. Sure, fella. NONE of it could EVER be helpful to anyone. You’re an idiot. The purpose of the article is to get your creative juices flowing, not necessarily to have you copy what you see. 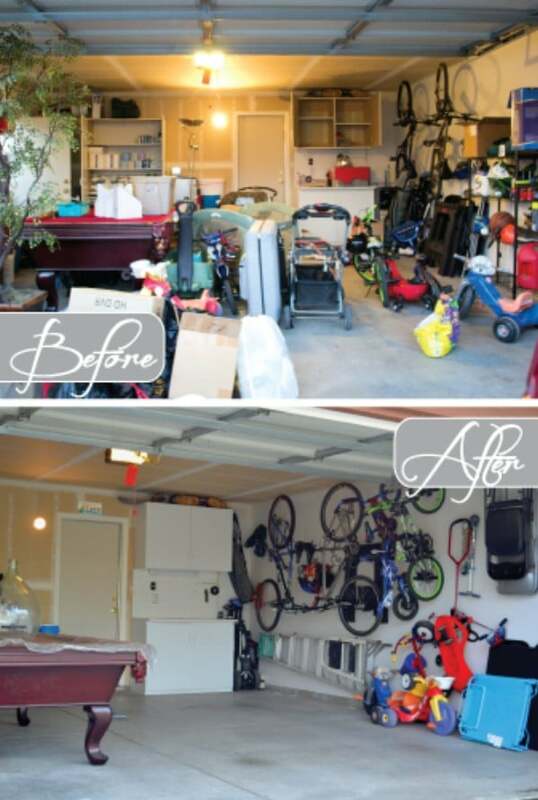 Not everyone has an immaculate double car garage to start with. 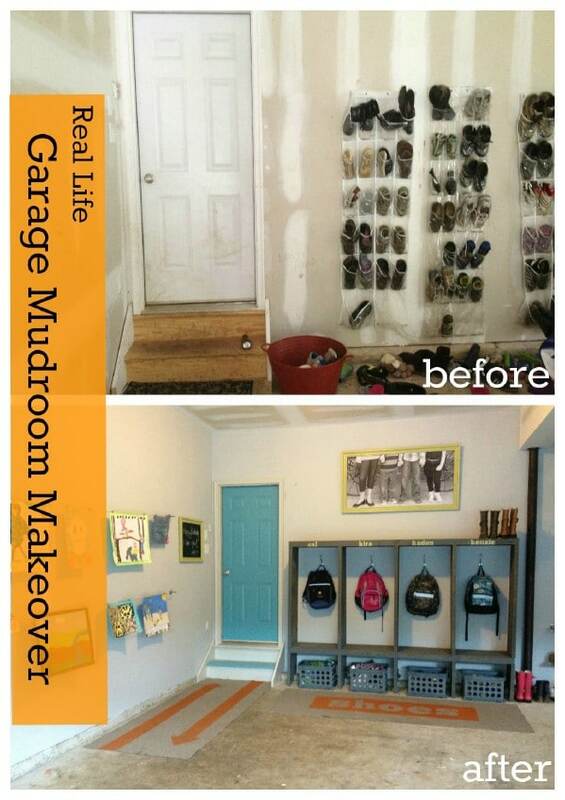 I don’t even have a garage, but a carport and I have done some really cool things there. Be a little more open minded. Hi DeAnna. 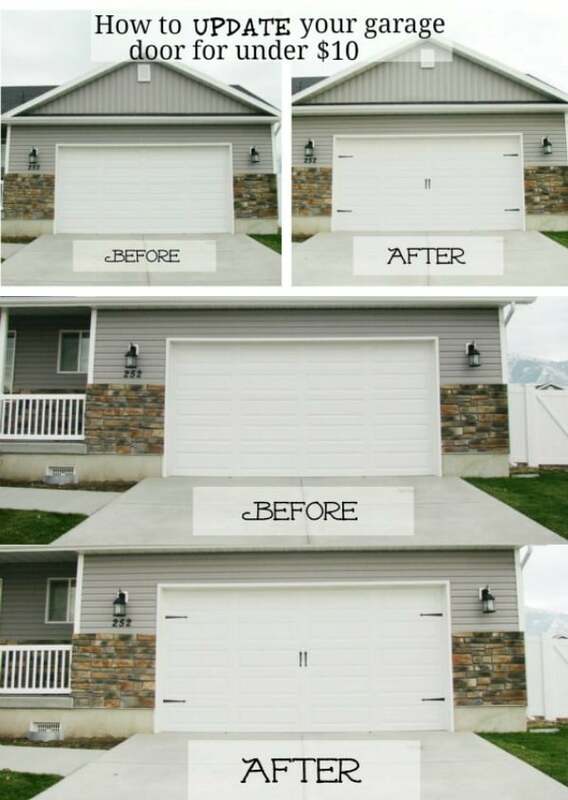 Could you give me some ideas with regards to the carport? 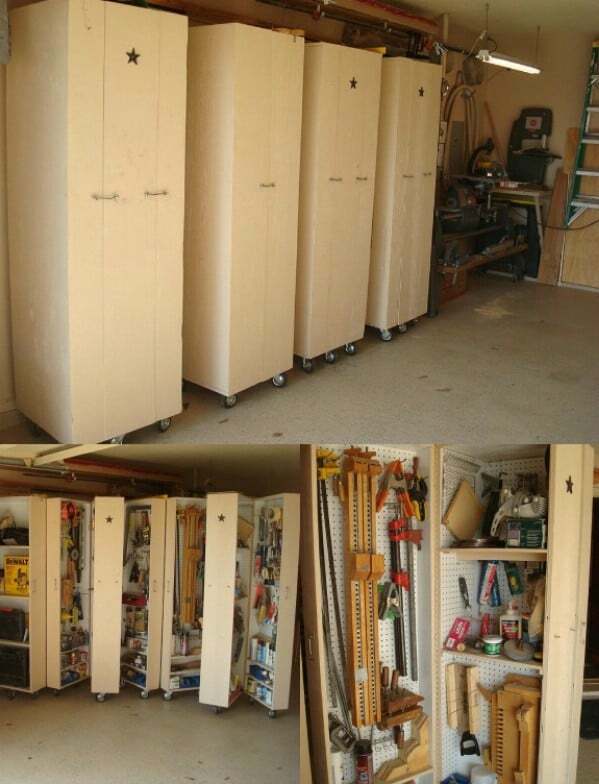 I am moving to a place that has one and need some ideas/inspiration for storage and workspace. Thanks in advance. …..or just throw out 95% of your crap that you haven’t used in 20 years!! 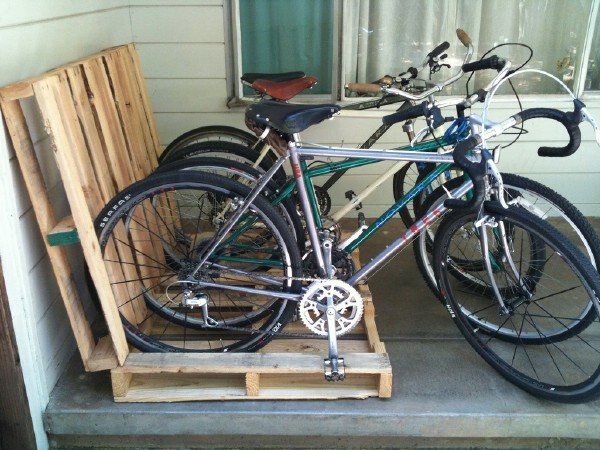 Good suggestion for my neighbors. 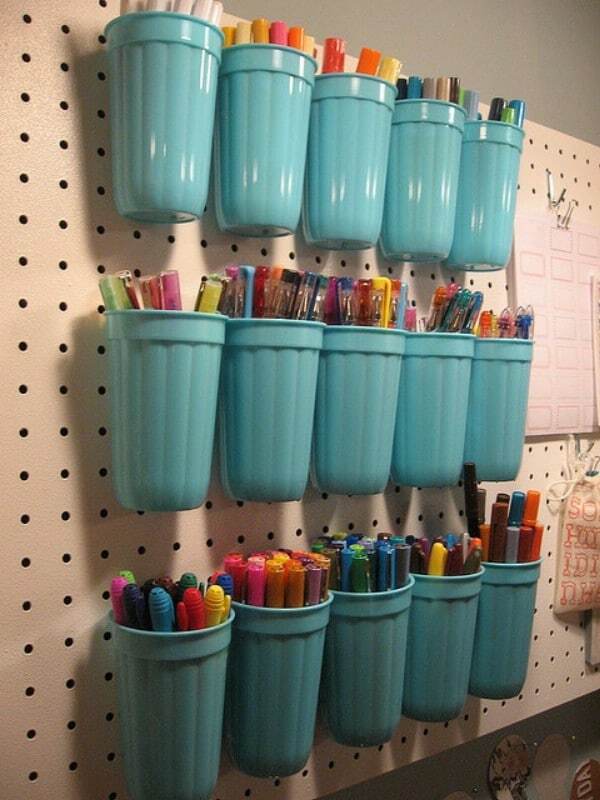 Why have I not thought of some of these, very simple and non cluttering ideas? Soon a little time and some more space to tinker ? Once you go through all the pages then they will open as one long page. Then I opened a Word doc and cut and pasted the whole thing. Now I can really see it, and click the links in the comments… haven’t figured out how to open comments for printing though. In Word you can also delete all the junk. And there are links all through the post, hopefully to pages with better pictures and directions. 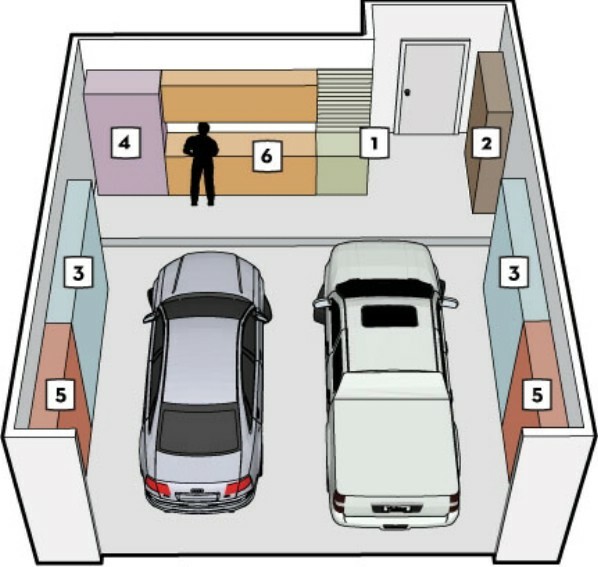 I just wanna get two cars in the two car garage! 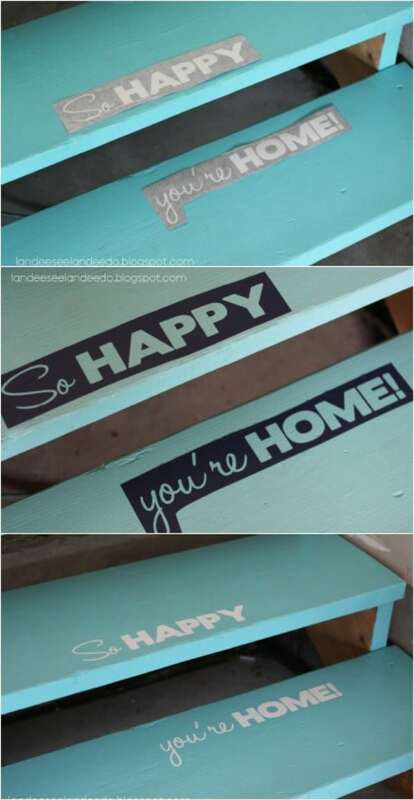 Cute DIY tips and information you have. 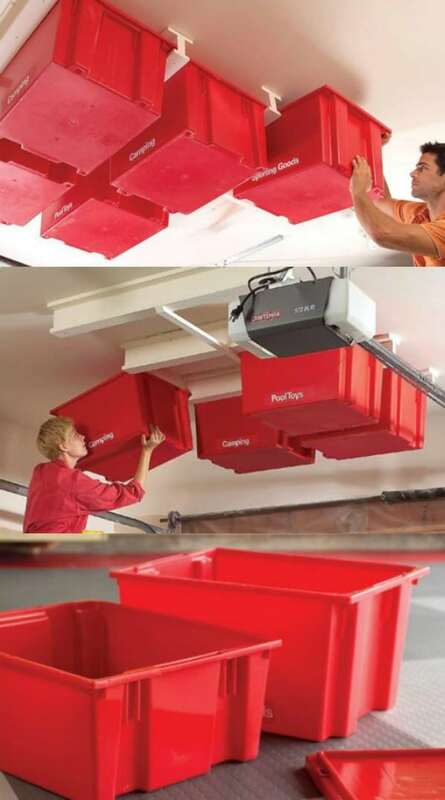 This can be useful in our garage to make nice and attractive to the visitor. Fabulous article!! I’m not sure that storing paint in jars is a good idea. More than 10 years ago, I sponge painted my bathroom. I mixed 4 or 5 custom colors to sponge over the solid base coat. I poured the left over mixed colors into baby food jars. Now they are either dried out or the lids are stuck on so I can’t use the colors for touch ups. Some of the paint on the walls has blistered and cracked even though I added glaze and I have no way to duplicate the colors to make repairs. 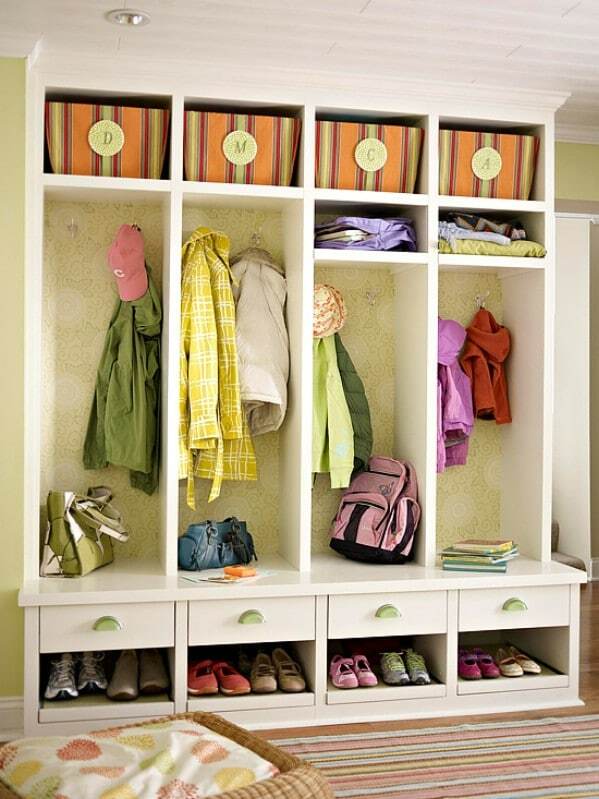 I will probably just cover some of them with small pictures or wide hooks for bathrobes, which are much needed anyway. Mason jars have a different type of lid – sort of a plate and a ring. If paint is left in there for ages and gets onto the plate, you can still pop it off and replace the plate – or both the plate and ring. If paint gets stuck to a baby jar lid, you’ll have a hard time twisting off the lid. Or ……. you could just try not to get any paint on any of the lids until you try to open the jar. Hope that helps. What a fantastic list of ideas! 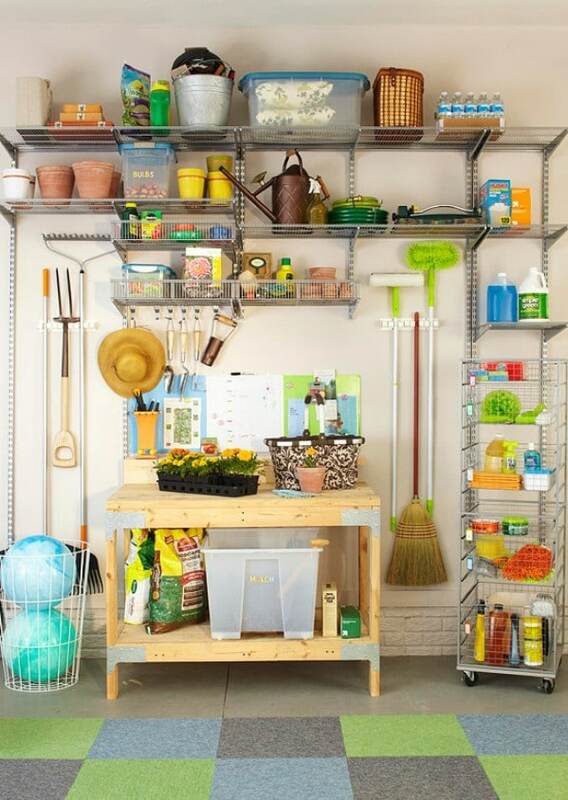 Good ideas…..just don’t store dog food in the garage – raccoons love dog food.